In this Catalan name, the paternal family name is Puigdemont and the maternal family name is Casamajó. Carles Puigdemont i Casamajó (Catalan: [ˈkaɾləs ˌpudʒðəˈmon i ˌkazəməˈʒo] ( listen); born 29 December 1962 in Amer, Girona) is a Catalan politician and journalist from Spain, currently living in Belgium. A former Mayor of Girona, Puigdemont served as President of the Government of Catalonia from January 2016 to October 2017 when he was removed from office by the Spanish Government following the unilateral Catalan declaration of independence. He is chair of the Catalan European Democratic Party (PDeCAT) and leader of the Junts per Catalunya (JuntsxCat) electoral alliance. After education in Amer and Girona, he became a journalist in 1982, writing for various local publications and becoming editor-in-chief of El Punt. He was director of the Catalan News Agency from 1999 to 2002 and director of Girona's House of Culture from 2002 to 2004. 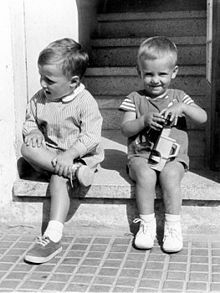 Puigdemont's family were supporters of Catalan independence and Puigdemont became involved in politics as a teenager, joining the nationalist Democratic Convergence of Catalonia (CDC), the predecessor to the PDeCAT, in 1980. He gave up journalism to pursue a career in politics in 2006 when he was elected as a member of the Parliament of Catalonia for the constituency of Girona. He was elected to the Municipality Council of Girona in 2007 and in 2011 he became Mayor of Girona. On 10 January 2016, following an agreement between the Junts pel Sí (JxSí), an electoral alliance led by the CDC, and the Popular Unity Candidacy (CUP), the Parliament of Catalonia elected Puigdemont as the 130th[disputed – discuss] President of Catalonia. On 6-7 September 2017, he approved laws for permitting an independence referendum, and the juridical transition and foundation of a Republic, a new constitution for Catalonia that would be in place if the referendum supported independence. On 1 October 2017, the Catalan independence referendum was held in Catalonia despite Spain's Constitutional Court ruling that it breached the Spanish constitution. Despite the closing of polling stations and the use of excessive force by Spanish Police 43% of Catalan citizens managed to vote in the illegal referendum, 92% of them supporting independence. The Catalan Parliament declared independence on 27 October 2017 which resulted in the Spanish government imposing direct rule on Catalonia, dismissing Puigdemont and the Catalan government. The Catalan Parliament was dissolved and the 2017 Catalan regional election was held. On 30 October 2017 charges of rebellion, sedition and misuse of public funds were brought against Puigdemont and other members of the Puigdemont Government. Puigdemont, along with others, fled to Belgium and European Arrest Warrants (EAW) were issued against them. At the regional elections held on 21 December 2017 Puigdemont was re-elected to Parliament and Catalan secessionists retained a slim majority. Official results shown an actual support for independence of 47.6% versus a 43.5% that voted constitutionalist parties, the rest being non-aligned parties and blank votes. Puigdemont called for fresh talks with the then Spanish Prime Minister Mariano Rajoy but these were rejected. Puigdemont remained in Belgium to avoid arrest if he returned to Spain, with this situation being defined as exile by some, self-imposed exile by some others, and also as fugitive from justice. On 25 March 2018, he was detained by a highway patrol in the northern German state of Schleswig-Holstein. He was released on bail, with the court deciding he could not be extradited for "rebellion" as German law does not coincide with Spanish law on the definition thereof, a requirement of his EAW. On 10 July, 2018 a Supreme Court judge suspended him as a deputy in the Catalan parliament. On 12 July 2018 a German court decided that he could be extradited back to Spain for misuse of public funds, but not for the more serious charge of rebellion. Following this, on 19 July 2018, Spain dropped the European Arrest Warrants against Puigdemont and other Catalan officials in exile. Puigdemont was born on 29 December 1962 in Amer, a small mountain village in the Province of Girona in north-eastern Catalonia. The son of Francesc Xavier Puigdemont i Oliveras, a baker, and his wife Núria Casamajó i Ruiz, he is the second of eight brothers. Puigdemont's grandfather, who fought in the Spanish Civil War before fleeing to France, founded the Pastisseria Puigdemont in 1928. The Puigdemont family still own the bakery located in Amer's main square. Puigdemont's great-grandfather and his uncle Josep Puigdemont were mayors of Amer and were supporters of Catalan independence, as was Puigdemont's father Xavier. Puigdemont received basic education in Amer before, aged nine, he was sent to study at the Church-run Santa Maria del Collell boarding school in Girona where he was taught in Spanish and "learned to be a fighter". At the age of 16 he was already a reporter for the Diari de Girona newspaper, writing articles on football and other news. As a teenager Puigdemont attended political meetings with his uncle Josep and helped found the Nationalist Youth of Catalonia. In 1980 he joined the Democratic Convergence of Catalonia (CDC), a conservative Catalan nationalist political party, now known as the Catalan European Democratic Party (PDeCAT). After school Puigdemont joined the University College of Girona to study Catalan philology but dropped out to pursue a career in journalism. In 1983, aged 21, Puigdemont was involved in a car accident which left him seriously injured and with a slight scar on his face. It has been suggested that this explains his Beatle haircut but friends deny this. Puigdemont joined the El Punt, a pro-independence Catalan language newspaper, as a journalist in 1982. He rose up the ranks to become the paper's editor-in-chief. He also wrote a weekly column for the Presència magazine. He is a member of the Catalan Journalists Association. Beginning in 1988, Puigdemont started collecting references about Catalonia in the international press, material that resulted in the publication of the 1994 book Cata... què? Catalunya vista per la premsa internacional ("Cata...what? Catalonia as seen by the foreign press"). During the 1992 Olympic Games in Barcelona Puigdemont was a member of an organisation supporting Catalan nationalists detained as part of "Operation Garzón". In the 1990s Puigdemont took a year off work to study linguistic policies elsewhere in Europe. As a result, he started working on application of new technologies in the provision of news and founded the Catalan News Agency (ACN) which was established by the Generalitat de Catalunya in 1999. Puigdemont also founded the Catalonia Today, an English language magazine. Puigdemont was director of ACN until 2002, when the then-president of the Diputació de Girona, Carles Pàramo, offered him the position of director of the Girona cultural centre, the Casa de Cultura, a position he held until 2004. Puigdemont left journalism to devote himself fully to politics in 2006 when the Convergence and Union (CiU) electoral alliance invited him to be a candidate for the Parliament of Catalonia. Puigdemont contested the 2006 regional election as a CiU candidate in the Province of Girona and was elected. He was re-elected at the 2010, 2012 and 2015 regional elections, the latter as a Junts pel Sí (JxSí) electoral alliance candidate. Puigdemont contested the 2007 local elections as a CiU candidate in Girona and was elected but the CiU remained in opposition. At the 2011 local elections, in which Puigdemont we re-elected, the CiU ended the Socialists's 32-year rule in Girona. Puigdemont became Mayor of Girona. He was re-elected at the 2015 local elections. He was a member of Executive Committee of the Association of Municipalities for Independence and in July 2015 succeeded Josep Maria Vila d'Abadal as its chair. Following a last-minute agreement between pro-Catalan independence parties Junts pel Sí and Popular Unity Candidacy to replace Artur Mas, Puigdemont was elected the 130th[disputed – discuss][verification needed] President of Catalonia on 10 January 2016. He resigned as Mayor of Girona on 11 January 2016 as no-one is allowed to be a regional president and a municipal mayor at the same time. He was the first President of Catalonia to refuse to take the oath of loyalty to the Spanish constitution and the Spanish monarch. In June 2017 Puigdemont announced that the Catalan independence referendum would be held on 1 October 2017. The Catalan Parliament passed legislation on 6 September 2017 authorising the referendum which would be binding and based on a simple majority without a minimum threshold. The following day Constitutional Court of Spain suspended the legislation, blocking the referendum. The Spanish government put into effect Operation Anubis in order to disrupt the organisation of the referendum and arrested Catalan government officials. Despite this the referendum went ahead though it was boycotted by opponents of secessionism and turnout was only 43%. Among those who voted 92% supported independence. Around 900 people were injured as the Spanish police used violence to try to prevent voting in the referendum. On 27 October 2017 the Catalan Parliament declared independence in a vote boycotted by opposition MPs. Almost immediately the Senate of Spain invoked article 155 of the constitution, dismissing Puigdemont and the Catalan government and imposing direct rule on Catalonia. The following day Spanish Prime Minister Mariano Rajoy dissolved the Catalan Parliament and called for fresh regional elections on 21 December 2017. On 30 October 2017 Spanish Attorney General José Manuel Maza laid charges of rebellion, sedition and misuse of public funds at the Audiencia Nacional against Puigdemont and other members of the Catalan government. The charges carry maximum sentences of 30, 15 and 6 years in prison respectively. Puigdemont and five other Catalan ministers (Dolors Bassa, Meritxell Borrás, Antoni Comín, Joaquim Forn and Meritxell Serret) arrived in Belgium on 30 October 2017. According to Spanish media the group had driven to Marseille shortly after the charges were laid before the Audiencia Nacional and from there flown to Brussels. Puigdemont claimed that he had gone to "the capital of Europe" to speak from a position of "freedom and safety" and that he would not return to Spain unless he was guaranteed a fair trial. Earlier Belgium's Secretary of State for Asylum, Migration and Administrative Simplification Theo Francken had stated that prospect of Puigdemont being granted asylum was "not unrealistic". On 3 November 2017 a Spanish judge issued European Arrest Warrants against Comín, Clara Ponsatí i Obiols, Lluís Puig, Puigdemont and Serret after they failed to attend a high court hearing in Madrid the previous day. On 5 November 2017 the five politicians, accompanied by their lawyers, surrendered to the Belgian police but after a ten-hour hearing a Belgian judge released them all on bail. They were ordered not to leave Belgium without permission and had to provide details of their accommodation. On 5 December 2017 the Supreme Court of Spain withdrew the European Arrest Warrant (EAW) against Puigdemont and four others stating that EAW weren't valid for alleged crimes committed by a wider group of people, e.g. the Catalan government. But judge Pablo Llarena warned that the national arrest warrants remain valid, meaning that the group risked arrest if they returned to Spain. While remaining self-exiled, Puigdemont contested the 2017 regional election as a Junts per Catalunya (JuntsxCat) electoral alliance candidate in the Province of Barcelona and was re-elected to Parliament. At the election Catalan secessionists retained a slim majority in the Catalan Parliament. After the election Puigdemont called for new unconditional talks with the Spanish government and that he was willing to meet Rajoy outside of Spain. Rajoy rejected the offer, saying that he was only willing to speak with the leader of the Catalan government, whom he considered to be Inés Arrimadas, leader of the unionist Citizens, the largest single party in the Catalan Parliament. On 1 March 2018, Puigdemont was hoping to be selected by the Catalan Parliament as President of Catalonia again, but the Catalan Parliament heeded warnings from Spain’s judiciary and postponed the session in which Puigdemont could be selected. Subsequently Puigdemont announced that he was no longer seeking re-election as leader of Catalonia. Later he announced the creation of a government-in-exile organization named "Council of the Republic". On 25 March 2018, while returning to Brussels from a trip to Finland, Puigdemont was stopped near the Danish border with Germany and arrested pursuant to the European warrant that had been reissued against him two days previously. On 5 April 2018, the Oberlandesgericht in the German state of Schleswig-Holstein ruled that Puigdemont would not be extradited on the charges of rebellion, and released him on bail. The court confirmed that Puigdemont may still be extradited based on charges of corruption. According to that decision, Puigdemont was required to report to police once a week and could not leave Germany without permission of the public prosecutor. After his release, Puigdemont called on Spain’s government to release Catalan separatists from imprisonment and establish a dialog with them. On 12 July 2018 the higher court in Schleswig-Holstein decided that Puigdemont could be extradited back to Spain to face charges of misuse of public funds, but not for the more serious rebellion charge. Puigdemont's legal team said they would appeal any decision to extradite him. Ultimately, though, Spain dropped its European arrest warrant, ending the extradition attempt. Puigdemont was once again free to travel, and chose to return to Belgium. In January 2019 Puigdemont filed a constitutional application for amparo directed against the president of the Catalan parliament, Roger Torrent and the Board of the Chamber. The complaint, presented to the Spanish Constitutional Court, argued Puigdemont had been denied the use of his political rights as Torrent did not allow him to delegate his vote from Belgium after Puigdemont's criminal indictment and suspension of his parliamentary condition by Supreme Court judge Pablo Llarena. Following the April 2019 arrest of WikiLeaks founder Julian Assange inside the Ecuadorian Embassy in London, Puigdemont said that "Human rights, and especially freedom of expression, are under attack once again in Europe." Puigdemont married Romanian journalist Marcela Topor in 2000. They have two daughters, Magali and Maria, and live in Girona. He speaks Catalan, English, French, Romanian and Spanish. 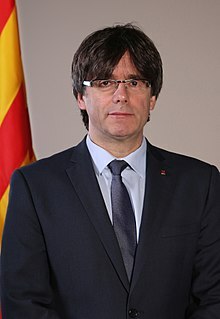 Puigdemont is a supporter of Girona FC and FC Barcelona and plays rock guitar and the electric piano. As a youngster Puigdemont played bass in a short-lived Catalan rock band formed about 1980. On 2 February 2018, the Belgian commune of Waterloo confirmed that he had rented a villa and planned to establish his official residence there. ^ "Presidents of the Generalitat". Government of Catalonia. ^ a b "The Puigdemont factor". Politico Europe. ^ "Catalan leader vows 'peaceful resistance' as Madrid takes control of region". The Guardian. 28 October 2017. ^ "Catalan parliament votes in new leader amid secession drive". Daily Mail. 10 January 2016. Puigdemont was voted in as Catalonia's 130th president in a 70-63 vote, with two abstentions in the 135-seat chamber. ^ Grierson, Jamie (30 September 2017). "Police close voting centres before Catalan referendum". the Guardian. Retrieved 29 October 2018. ^ "Spain: Police Used Excessive Force in Catalonia". Human Rights Watch. 12 October 2017. Retrieved 29 October 2018. ^ "Exiled Catalan leader Carles Puigdemont ordered to return for re-election". The Telegraph. 28 January 2018. Retrieved 15 February 2018. ^ "Catalonia Separatists Support Re-Election of Exiled Leader Puigdemont". The Wall Street Journal. 10 January 2018. Retrieved 15 February 2018. ^ "Catalonia's Separatists: In Exile. In Jail. In Power?". New York Times. 5 January 2018. Retrieved 15 February 2018. ^ a b "Fugitive Catalan leader denies giving up independence bid after text messages saying 'battle is over'". The Independent. 31 January 2018. Retrieved 13 February 2018. ^ a b "Exiled Catalan leader rents £4,000-a-month house in Belgium, fuelling rumours he won't go home". The Telegraph. 2 February 2018. Retrieved 13 February 2018. ^ "Carles Puigdemont: Former Catalan president 'detained'". 25 March 2018. Retrieved 25 March 2018 – via www.bbc.com. ^ "Catalan leader Carles Puigdemont held by German police". 25 March 2018. Retrieved 25 March 2018 – via www.theguardian.com. ^ "Puigdemont, detenido por la policía alemana cuando entraba desde Dinamarca". ELMUNDO (in Spanish). Retrieved 25 March 2018. ^ Oltermann, Philip. "Carles Puigdemont can be extradited to Spain, German court rules". The Guardian. Retrieved 12 July 2018. ^ "Catalan case: Spain drops warrant against Puigdemont". BBC. Retrieved 19 July 2018. ^ a b c d e f g h i "Who is Catalan President Carles Puigdemont?". Al Jazeera. Doha, Qatar. 4 November 2017. Archived from the original on 6 November 2017. Retrieved 25 December 2017. ^ a b c d e "Ousted Catalan President Puigdemont scores comeback in latest election". The Japan Times. Tokyo, Japan. Agence France-Presse. 22 December 2017. Archived from the original on 22 December 2017. Retrieved 25 December 2017. ^ a b c d e Longbottom, Wil (29 October 2017). "Rajoy vs Puigdemont: A profile of two leaders". Sky News. London, UK. Archived from the original on 29 October 2017. Retrieved 25 December 2017. ^ Beals, Gregory (19 October 2017). "The Catalan President: A Small-Town Boy Who Could Destroy Europe". The Daily Beast. New York, US. Archived from the original on 31 December 2017. Retrieved 26 December 2017. ^ a b c d e f g h i j k Hennessy-Fiske, Molly; Badcock, James (25 October 2017). "Up against Spain's government, can Catalonia's president stick to his dream of independence?". Los Angeles Times. Los Angeles, US. Archived from the original on 30 October 2017. Retrieved 26 December 2017. ^ Martin, Nicolas (13 October 2017). "Catalonia's Carles Puigdemont: 'Puigdi's' deep political roots". Deutsche Welle. Bonn, Germany. Archived from the original on 28 December 2017. Retrieved 26 December 2017. ^ McLaughlin, Erin; Rebaza, Claudia (10 October 2017). "Catalan President Puigdemont has 'independence at his core'". CNN. Atlanta, US. Archived from the original on 28 December 2017. Retrieved 25 December 2017. ^ a b Jackson, Patrick (22 December 2017). "Carles Puigdemont: The man who wants to break up Spain". BBC News. London, UK. Archived from the original on 26 December 2017. Retrieved 26 December 2017. ^ a b c "Carles Puigdemont: freedom fighter or the enemy within". Euronews. Lyon, France. 10 October 2017. Archived from the original on 10 October 2017. Retrieved 26 December 2017. ^ a b c d e f g h Leadbetter, Russell (1 October 2017). "Scourge of Madrid: the guitar-playing president of Catalonia". The Herald. Glasgow, UK. Archived from the original on 28 December 2017. Retrieved 26 December 2017. ^ "La Campana Editorial – Cata...què?". lacampanaeditorial.com (in Spanish). Archived from the original on 24 September 2017. Retrieved 27 October 2017. ^ a b Cook, Jesselyn (21 October 2017). "Who Is Carles Puigdemont, Leader Of Catalonia's Controversial Independence Movement?". HuffPost UK. London. UK. Archived from the original on 28 December 2017. Retrieved 26 December 2017. ^ "Puigdemon'ts profile as a MP". Parlament de Catalunya (in Catalan). Archived from the original on 9 January 2016. ^ a b "Eleccions al Parlament de Catalunya 2006: Candidats electes" (PDF) (in Catalan). Departament de Governació, Administracions Públiques i Habitatge, Generalitat de Catalunya. p. 2. Retrieved 26 December 2017. ^ a b "Eleccions al Parlament de Catalunya 2010: Candidats electes" (PDF) (in Catalan). Departament de Governació, Administracions Públiques i Habitatge, Generalitat de Catalunya. p. 2. Retrieved 26 December 2017. ^ a b "Eleccions al Parlament de Catalunya 2012: Candidats electes" (PDF) (in Catalan). Departament de Governació, Administracions Públiques i Habitatge, Generalitat de Catalunya. p. 2. Retrieved 26 December 2017. ^ a b "Eleccions al Parlament de Catalunya 2015: Candidats electes" (PDF) (in Catalan). Departament de Governació, Administracions Públiques i Habitatge, Generalitat de Catalunya. p. 2. Retrieved 26 December 2017. ^ a b "Consulta de Resultados Electorales: Municipales / Mayo 2007 - Mun. Girona" (in Spanish). Madrid, Spain: Ministry of the Interior. Retrieved 26 December 2017. ^ a b "Consulta de Resultados Electorales: Municipales / Mayo 2011 - Mun. Girona" (in Spanish). Madrid, Spain: Ministry of the Interior. Retrieved 26 December 2017. ^ "Carles Puigdemont (CiU) serà el nou alcalde de Girona i acaba amb 32 anys d'hegemonia del PSC". Ara.cat (in Catalan). 22 May 2011. Archived from the original on 9 January 2016. Retrieved 9 January 2016. ^ a b "Consulta de Resultados Electorales: Municipales / Mayo 2015 - Mun. Girona" (in Spanish). Madrid, Spain: Ministry of the Interior. Retrieved 26 December 2017. ^ March, Oriol (27 December 2015). "La refundació de CDC passa pels alcaldes". Ara. p. 22. ^ "La "mentira" de los 131 presidentes de la Generalitat". El País. 20 May 2018. ^ "Catalan parliament votes in new leader amid secession drive". Daily Mail. London, UK. Associated Press. 10 January 2016. Retrieved 1 January 2018. ^ Zach, Paul (9 October 2017). "Priorities of Catalan leader Puigdemont: Independence and independence". The Straits Times. Singapore. Retrieved 1 January 2018. ^ Ghosh, Agamoni (11 January 2016). "Spain: Mariano Rajoy vows unity as Catalonia elects Carles Puigdemont as president". International Business Times. New York, US. Retrieved 1 January 2018. ^ "Carles Puigdemont: This is not just about Catalonia. This is about democracy itself Carles Puigdemont". The Guardian. London, UK. 6 November 2017. Retrieved 1 January 2018. ^ Puigdemont, Carles (22 September 2017). "Sorry, Spain. Catalonia is voting on independence whether you like it or not". The Washington Post. Washington, DC, US. Retrieved 1 January 2018. ^ "Carles Puigdemont, de alcalde de Girona a president de la Generalitat" [Carles Puigdemont, from mayor of Girona to president of the Generalitat]. La Vanguardia (in Spanish). 9 January 2016. Retrieved 10 January 2016. ^ "The parties in Catalonia have reached an agreement to form an independentist government". Vilaweb. 9 January 2016. Retrieved 9 January 2016. ^ "Puigdemont renuncia a la alcaldía de Girona tras ser investido President". La Sexta (in Spanish). 11 January 2016. Archived from the original on 15 January 2016. Retrieved 11 January 2016. ^ Dowsett, Sonya (9 June 2017). "Catalonia calls October referendum on independence from Spain". Reuters. London, UK. Archived from the original on 28 December 2017. Retrieved 26 December 2017. ^ "Tensions grow in Spain as Catalonia independence referendum confirmed". The Daily Telegraph. London, UK. 9 June 2017. Archived from the original on 10 June 2017. Retrieved 26 December 2017. ^ "Catalonia's lawmakers give nod to independence referendum". Deutsche Welle. Bonn, Germany. 6 September 2017. Archived from the original on 28 December 2017. Retrieved 26 December 2017. ^ Mortimer, Caroline (1 October 2017). "Catalan independence referendum: '844 injured in clashes with police', says regional government". The Independent. London, UK. Archived from the original on 28 December 2017. Retrieved 26 December 2017. ^ "Spain's constitutional court suspends Catalan referendum law: court source". Reuters. London, UK. 7 September 2017. Archived from the original on 14 October 2017. Retrieved 26 December 2017. ^ Strange, Hannah (7 September 2017). "Spain's constitutional court suspends Catalan referendum law". The Daily Telegraph. London, UK. Archived from the original on 20 October 2017. Retrieved 26 December 2017. ^ Jones, Sam; Burgen, Stephen (21 September 2017). "Spain crisis: 'stop this radicalism and disobedience,' PM tells Catalan leaders". The Guardian. London, UK. Archived from the original on 19 October 2017. Retrieved 26 December 2017. ^ Castillo, Raquel; Edwards, Sam (20 September 2017). "Spanish police raid Catalan government to halt banned referendum". Reuters. London, UK. Archived from the original on 27 October 2017. Retrieved 26 December 2017. ^ Minder, Raphael (26 September 2017). "Crisis in Catalonia: The Independence Vote and Its Fallout". The New York Times. Retrieved 16 June 2018. ^ "Catalonia's bid for independence from Spain explained". BBC News. London, UK. 22 December 2017. Archived from the original on 25 October 2017. Retrieved 26 December 2017. ^ Jones, Sam; Burgen, Stephen (2 October 2017). "Catalan leader calls for mediation with Spain over independence". The Guardian. London, UK. Archived from the original on 28 December 2017. Retrieved 26 December 2017. ^ "Catalan crisis: Spain's Rajoy vows to end 'separatist havoc'". BBC News. London, UK. 12 November 2017. Archived from the original on 15 November 2017. Retrieved 26 December 2017. ^ McGuinness, Alan (11 October 2017). "Spain calls emergency meeting after Catalonia declares independence". Sky News. London, UK. Archived from the original on 28 December 2017. Retrieved 26 December 2017. ^ "Catalonia referendum: Madrid representative apologises for police violence during vote". ABC News. Sydney, Australia. Reuters. 6 October 2017. Archived from the original on 4 November 2017. Retrieved 26 December 2017. ^ Child, David (3 October 2017). "Catalan vote: Claims of Spanish police brutality probed". Al Jazeera. Doah, Qatar. Archived from the original on 29 October 2017. Retrieved 26 December 2017. ^ "Catalan referendum: Catalonia has 'won right to statehood'". BBC News. London, UK. 2 October 2017. Archived from the original on 31 October 2017. Retrieved 26 December 2017. ^ "Catalans declare independence as Madrid imposes direct rule". BBC News. London, UK. 27 October 2017. Archived from the original on 4 November 2017. Retrieved 26 December 2017. ^ "Catalonia declares independence as Spain prepares to impose direct rule". The Independent. London, UK. 27 October 2017. Archived from the original on 31 October 2017. Retrieved 26 December 2017. ^ Jones, Sam; Burgen, Stephen; Graham-Harrison, Emma (28 October 2017). "Spain dissolves Catalan parliament and calls fresh elections". The Guardian. London, UK. Archived from the original on 6 November 2017. Retrieved 26 December 2017. ^ Burgess, Sanya (27 October 2017). "Catalan votes for independence as Madrid approves direct rule". The National. Abu Dhabi, U.A.E. Archived from the original on 28 December 2017. Retrieved 26 December 2017. ^ "Catalonia independence: Rajoy dissolves Catalan parliament". BBC News. London, UK. 28 October 2017. Archived from the original on 22 November 2017. Retrieved 26 December 2017. ^ Smith-Spark, Laura; Rebaza, Claudia (28 October 2017). "Catalonia government dissolved after declaring independence from Spain". CNN. Atlanta, US. Archived from the original on 6 November 2017. Retrieved 26 December 2017. ^ "Charges of rebellion and sedition called for by Spain's attorney general against Puigdemont and other Catalan officials". The Local. Stockholm, Sweden. 1 November 2017. Archived from the original on 28 December 2017. Retrieved 26 December 2017. ^ Newton, Creede (30 October 2017). "Spain prosecutor files charges against Catalan leaders". Al Jazeera. Doha, Qatar. Archived from the original on 4 November 2017. Retrieved 26 December 2017. ^ Baynes, Chris (30 October 2017). "Catalonia independence: Spanish state prosecutor says Catalan leaders will be charged with rebellion, sedition and misuse of public funds". The Independent. London, UK. Archived from the original on 30 October 2017. Retrieved 26 December 2017. ^ "Catalan independence: Carles Puigdemont in Belgium, lawyer says". BBC News. London, UK. 31 October 2017. Archived from the original on 31 October 2017. Retrieved 26 December 2017. ^ Stone, Jon (30 October 2017). "Catalan leader Carles Puigdemont has fled the country amid rebellion charges". The Independent. London, UK. Archived from the original on 5 November 2017. Retrieved 26 December 2017. ^ Jones, Sam (31 October 2017). "Catalan leaders facing rebellion charges flee to Belgium". The Guardian. London, UK. Archived from the original on 30 October 2017. Retrieved 26 December 2017. ^ "Catalonian leader Carles Puigdemont flees to Belgium amid accusations of sedition from Spain". ABC News. Sydney, Australia. 31 October 2017. Archived from the original on 4 November 2017. Retrieved 26 December 2017. ^ Stone, Jon (31 October 2017). "Carles Puigdemont says he can't return to Catalonia because Spain is intent on 'vengeance'". The Independent. London, UK. Archived from the original on 31 October 2017. Retrieved 26 December 2017. ^ Erlanger, Steven; Minder, Raphael (31 October 2017). "From Brussels, the Deposed Leader of Catalonia Pleads With a Wary Europe". The New York Times. New York, US. Archived from the original on 7 November 2017. Retrieved 27 December 2017. ^ Crisp, James (31 October 2017). "Ex-Catalan leader Carles Puigdemont: 'I am not seeking asylum'". The Daily Telegraph. London, UK. Archived from the original on 28 December 2017. Retrieved 26 December 2017. ^ "'Not unrealistic' for Catalan leader to get asylum in Belgium: minister". Reuters. London, UK. 29 October 2017. Archived from the original on 5 November 2017. Retrieved 26 December 2017. ^ "Asylum for Carles Puigdemont in Belgium 'not unrealistic'". Sky News. London, UK. 29 October 2017. Archived from the original on 27 December 2017. Retrieved 26 December 2017. ^ "Catalonia crisis: Spain issues warrant for Puigdemont". BBC News. London, UK. 3 November 2017. Archived from the original on 3 November 2017. Retrieved 27 December 2017. ^ Jones, Sam; Boffey, Daniel (3 November 2017). "European arrest warrant issued for ex-Catalan leader Carles Puigdemont". The Guardian. London, UK. Archived from the original on 20 December 2017. Retrieved 27 December 2017. ^ Minder, Raphael; Schreuer, Milan (3 November 2017). "Spain Issues Arrest Warrant for Ousted Catalan Leader". The New York Times. New York, US. Archived from the original on 7 November 2017. Retrieved 27 December 2017. ^ Schreuer, Milan (5 November 2017). "Puigdemont and Other Catalonia Separatists Report to Belgian Police". The New York Times. New York, US. Archived from the original on 7 November 2017. Retrieved 27 December 2017. ^ "Catalonia ex-officials surrender to Belgian police". BBC News. London, UK. 5 November 2017. Archived from the original on 6 November 2017. Retrieved 27 December 2017. ^ Boffey, Daniel (5 November 2017). "Carles Puigdemont bailed pending Brussels ruling". The Guardian. London, UK. Archived from the original on 7 November 2017. Retrieved 27 December 2017. ^ "Catalonia ex-officials freed by Belgian judge". BBC News. London, UK. 6 November 2017. Archived from the original on 6 November 2017. Retrieved 27 December 2017. ^ Stone, Jon (5 December 2017). "Spain withdraws international arrest warrant for ousted Catalan president Carles Puigdemont". The Independent. London, UK. Archived from the original on 28 December 2017. Retrieved 27 December 2017. ^ "Spanish court withdraws arrest warrant for ousted Catalan leader". CNN. Atlanta, US. 5 December 2017. Archived from the original on 28 December 2017. Retrieved 27 December 2017. ^ Burgen, Stephen; Boffey, Daniel (5 December 2017). "Spanish judge withdraws arrest warrant for Carles Puigdemont". The Guardian. London, UK. Archived from the original on 27 December 2017. Retrieved 27 December 2017. ^ "Spain withdraws European arrest warrant for Puigdemont". Al Jazeera. Doha, Qatar. 5 December 2017. Archived from the original on 26 December 2017. Retrieved 27 December 2017. ^ a b "Eleccions al Parlament de Catalunya 2017: Composició del Parlament" (in Catalan). Generalitat de Catalunya. Archived from the original on 22 December 2017. Retrieved 26 December 2017. ^ Jackson, Russell (22 December 2017). "Catalan independence supporters win majority in election". The Scotsman. Edinburgh, UK. Archived from the original on 28 December 2017. Retrieved 27 December 2017. ^ Parra, Aritz; Giles, Ciaran (21 December 2017). "Catalan secessionist parties win slim majority in regional parliament". Toronto Star. Toronto, Canada. Associated Press. Archived from the original on 28 December 2017. Retrieved 27 December 2017. ^ "Catalan leader Puigdemont urges Madrid to start talks after separatists' election win". Euronews. Lyon, France. 22 December 2017. Archived from the original on 27 December 2017. Retrieved 27 December 2017. ^ "Catalonia election: Puigdemont calls for talks with Spain". BBC News. London, UK. 22 December 2017. Archived from the original on 26 December 2017. Retrieved 27 December 2017. ^ Sengupta, Kim (22 December 2017). "Catalonia election: Mariano Rajoy rejects call for talks outside Spain from Carles Puigdemont". The Independent. London, UK. Archived from the original on 28 December 2017. Retrieved 27 December 2017. ^ "Fugitive former Catalan leader's call for talks with Madrid rejected by PM Rajoy". South China Morning Post. Hong Kong, China. Agence France-Presse, Associated Press. 22 December 2017. Archived from the original on 28 December 2017. Retrieved 27 December 2017. ^ Hume, Tim. "Catalonia's exiled leader drops bid to be president again". Vice News. ^ Piñol, Àngels; Baquero, Camilo S. (2 March 2018). "Catalan separatists want to create symbolic institutions in Brussels". El País. ^ Madrid, Owen Bowcott Sam Jones in (2 March 2018). "Exclusive: Puigdemont vows to lead Catalan government in exile". The Guardian. ^ "Fugitive former Catalan president Carles Puigdemont arrested in Germany". The Independent. 25 March 2018. ^ "Catalonia ex-leader Carles Puigdemont arrested in Germany". www.aljazeera.com. ^ what was requested by the public prosecutor for Schleswig-Holstein on 3 April 2018 (see German prosecutors seek extradition of Catalonia's Carles Puigdemont, dw.com, 3 April 2018). ^ a b "Germany refuses to extradite Catalonia's Puigdemont on rebellion charges". The Independent. 5 April 2018. Retrieved 5 April 2018. ^ WELT (5 April 2018). "Oberlandesgericht: Kataloniens Ex-Präsident Carles Puigdemont kommt unter Auflagen frei". DIE WELT. Retrieved 5 April 2018. ^ "Leaving jail, Puigdemont calls for dialogue with Madrid". Reuters. 6 April 2018. ^ Puente, Arturo; Cortijo, Gonzalo (21 January 2019). "Puigdemont lleva a Torrent y la Mesa del Parlament ante el Constitucional por retirarle la delegación de voto". eldiario.es. ^ a b Couzens, Gerard (26 October 2017). "Catalonia on brink of independence". Daily Express. London, UK. Retrieved 26 December 2017. ^ "Catalan crisis: Carles Puigdemont 'welcome' to run in poll". BBC News. London, UK. 29 October 2017. Archived from the original on 7 November 2017. Retrieved 26 December 2017. ^ a b Orihuela, Rodrigo (10 October 2017). "Catalonia's President Says Jail Beats Staying Spanish". Bloomberg Businessweek. New York, US. Archived from the original on 28 December 2017. Retrieved 26 December 2017. ^ "Waterloo bevestigt verhuizing Puigdemont" (in Dutch). HP De Tijd. 2 February 2018. Retrieved 3 February 2018. 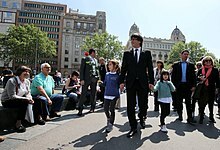 ^ "UNPO: Catalonia: Ex-Premier Carles Puigdemont to Run for May 26th European Elections". unpo.org. Retrieved 14 March 2019. Wikimedia Commons has media related to Carles Puigdemont.